Plus this: Peter Cook Heavy duty adhesive. 1. Strip everything off the seat pan and if necessary give it a good sand­blasting. Now you’ll know what shape your pan is in and where to begin. 2. Decide in which degree you want to restore your seat. You probably want to go all in on fixing little cracks and weld stuff that needs weldning since you are not going to want to do this when your seat is upholstered and nice… So, make sure all holes for the rivets on the perimeter are even spaced, since they’re gonna be visible when done. Make sure the front bracket is not broken. Make sure the egde of the pan is not too badly bent and wavy. And that’s about it. 3. Paint the pan, inside and outside. Inside? Why? Its not going to be visible? Well, at some point (unless you live in always sunny SoCal) it’s going to get wet and rusty if you don’t do it. It doesn’t have to the thickest layer inside, You still want the glue to be able to stick, so just a thin layer will do fine. Also If your seat is not fitted with “vent” holes in the bottom drill some, for conden­sation moist not to build up under the foam. 4. 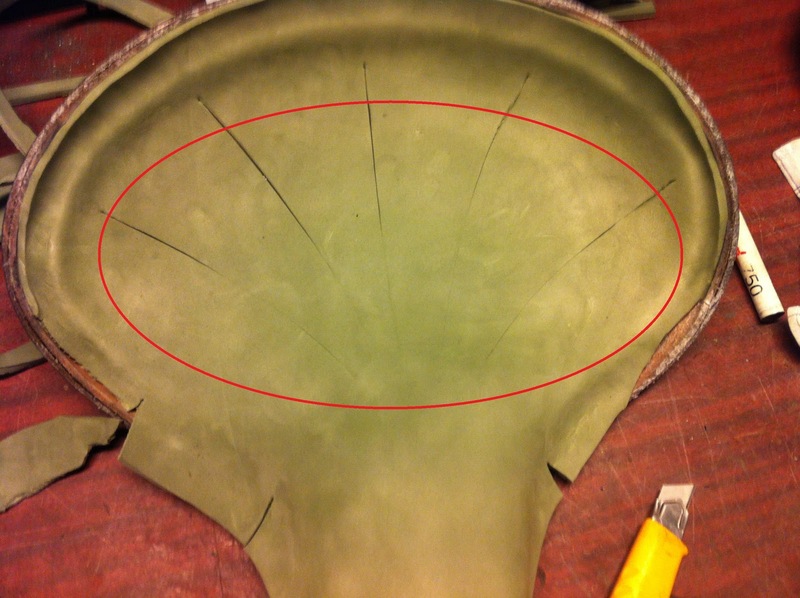 Cut long strips of thick leather (3mm – 1/8 in) to go on either side of the edge. Depending on the distance from your rivet holes to the edge, cut strips of about 50 mm - 2 inches in width and make them as long as possible. Soak the strips in water for about 20 min, that’ll make them tractable when you’re going to force them around the curves. Mark up the center (lengthwise) of the strips and punch/cut a hole about 2/3’s from the bottom edge. Start by riveting the middle of the rear ridge on the seat, working your way towards the nose of the seat, from both sides, making sure at all times that the leather is symmetric around the middle. Of course this only applies if your strips aren’t long enough to reach all around the perimeter, but still keep in mind that somewhere there’s going to be a joint, so you might as well do it in the middle of the nose. Riveting done, and stitching the four pieces together on either side, symmetric around the center axis. As you’ll notice, I’ve cut notches in the leather on the inside top of the nose, to relief stress and make it easier to bend. The reason why I apply thick strips of leather on both sides is that this will prevent the metal edge from working its way through the thinner top leather and it’ll make the finished edge much nicer. 5. Time for foam. I use cheap sleeping pad for foam. It’s got three advantages over regular foam: One, it’s easy to apply. Two, it’s easy to shape. Three, it doesn’t act like a sponge when soaked after a long days ride in the rain. Cut thin strips to glue in the little reinforcement voids. And trim excess off. Just use Locktite super glue, it dries up quick (10 sec) and is sh…t easy to use. Now lay the foam on top of your seat press it down with one hand and with the other mark with a speedmarker the very rough outline. You want to have the foam reaching the outer edge of the leather. Rough the surface slightly, with some sandpaper p120-180, to give the glue a surface easy to bind to. Wipe down with thinner or alcohol. Apply glue on both seat and foam and basically just follow the instructions on the can, as regarding to drying time and so on. I’ve tested this specific glue “Peter Cook”’s ability to glue soaking wet leather on foam, and found it excellent. This will prove to be very useful later on. 6. Trim and repeat: Trim roughly and mark the outline of the second glue area => Second layer of foam. Depending on how thick you want your padding, chose how many layers you put on. I usually aim for around 15-20mm = 5/8 – ¾ in. Glue on the next layer the same way as before. Massage it down and make sure it’s staying down! Cut grooves if necessary. We’ll finish it up in the next episode: Part 2. The professor says: Stay safe!!! !